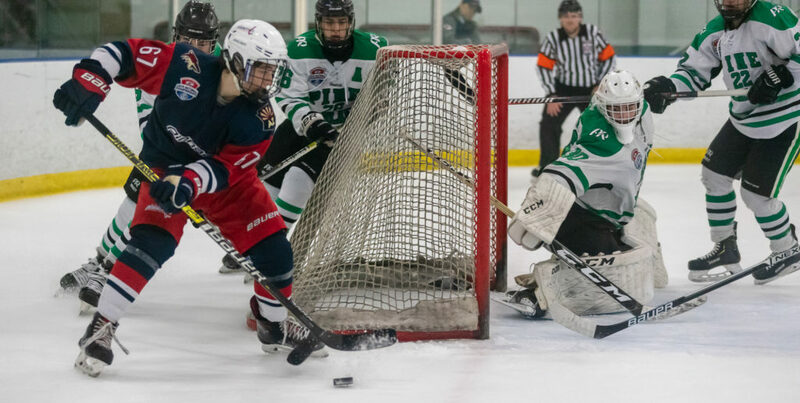 STRONGSVILLE, Oh — In a showdown between the Pennsylvania “AA” State Champions and the Arizona D-1 State Champions, the Pine-Richland Rams came out on top over the Pinnacle Pioneers 4-3. Brandon Kashur scored first for the Rams in what ended up being a close contest, but Max Cocreham tied the game with a power-play goal. The tie would not last long as William Studt found the back a mere 36 seconds later. Logan Hawley scored to tie the game at 5:48 of the second. Nicholas Lindauer broke the tie late in the second on the power-play. Jared Eggert scored the eventual game-winner 35 seconds into the final period. A Nick Palermo goal brought the Pioneers within one, but the Rams held off the attack to hold on to the victory. Daniel Stauffer stopped 14 of 17 SOG (.824%) for the Rams, while Austin Schwab stopped 25 of 29 SOG (.862%) for the Pioneers. Pine-Richland secures the No. 1 seed from pool play and will face Regis Jesuit (CO) Sunday, March 31st. Pinnacle claims the No. 2 seed and will play another PA State Champion, West Chester – Bayard Rustin on Sunday, March 31st. Pine-Richland’s Jared Eggert is tied for 2nd in points with 6. Daniel Stauffer is in 3rd for Save % with a 0.947. Connor Ziegler leads the Pioneers with 3 goals. Goaltender Austin Schwab has allowed 6 goals through 3 games.